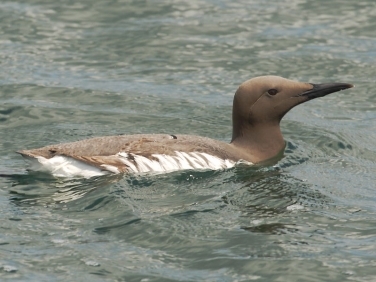 The identification differences between the two most common species of Auk seen around the British Isles, the Guillemot (Uria aalge) and Razorbill (Alca torda), aren’t always easy to appreciate at distance but when seen close up the key distinguishing features mentioned in British bird identification guides are instantly obvious. The bills are radically different in shape with the Razorbill appropriately having a broad blunt bill designed to hold on to more than one sandeel at a time compared to the sharply pointed, narrow bill of the Guillemot. The overall plumage of the Guillemot above the water is brown in comparison to black on the Razorbill which gives the latter a much smarter black and white appearance. However, despite seeing both these species regularly from the shore and when out at sea around the Cornish coast, we still find it surprising how difficult it is to be certain of identifying them correctly when seen at quite modest distances. The Guillemot photographed presented no such problems as it sat calmly on the water twenty metres from the boat when out in Falmouth Bay at the weekend. 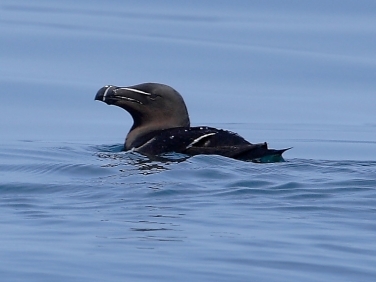 During the recent onshore gales good numbers of sea birds including Auks, Manx Shearwaters, Kittiwakes, Gannets and occassional Pomarine and Great Skuas were seen in the Bay but since the winds dropped so have the numbers of passing seabirds. What a shame there aren’t the numbers when the sea is calm. It would certainly make sea-watching from the shore a more pleasurable past time and a pelagic less stomach churning!